If you can't see a menu bar here, then you have to unblock content or use the ISOTBA Site Map (linked below). Join the Blue Agave tequila & mezcal discussion forum to ask questions, make comments, vote in polls, rate your favourite tequilas or simply meet other tequila aficionados. The CRT has reported a continuing drop in the number of agave being planted since 2000, from 40-60 million during the shortage to only 12 million in 2006, or about 4,000 hectares. Estimates suggest that in 2007 25-35% fewer agave will be planted to allow farmers to plant corn and other cash crops. The current agave glut will last through to 2009 and as demand for ethanol rises, more farmers will dig up their agave fields to plant corn (which has undergone a recent increase in its selling price). But that means by 2010, there won't be enough mature agave to satisfy the expected, growing demand. A portion of Mexico's land of the Blue Agave is today a UNESCO World heritage site, recognizing the millennia-old relationship between humans and agave. Archeologists have found evidence that agave were used for food as far back as 9,000 years ago. The agave plant was used for cloth and fermented drink for at least the past 2,000 years. The World Heritage property also includes archaeological sites from the Teuchitlan culture which was present in the Tequila area from 200 to 900 C.E. These people built terraces in the rolling hills for agriculture, as well as houses, temples, ceremonial mounds and ball courts. Agaves grow in a remarkable range of terrains and climates. They are found in forests, hillsides, arid plains, deserts and sea coasts, at altitudes extending from sea level to 2,400m (approx. 8,000 ft.).They can survive temperatures ranging from -9 to +41 degrees Celsius (about 15 to 106 degrees Fahrenheit ). The Blue Agave is just one of 136 species of agave that grow in Mexico (with 26 sub-species, 29 varieties and 7 types). Agaves were the source of many essential items, including fibres for clothing, poultices for wounds, medicines, poisons for arrowheads, building materials and food. As food, the use dates back about 11,000 years based on archeological remains of cooked agave in pits. Even today, agave fibre is used for cloth and paper, although not nearly as much as the industry produces as waste from the tequila production. The agave provided so many essential materials and that it became known as El Arbol de las Maravillas (The Tree of Wonders). Many Pre-Columbian people in Mesoamerica cultivated the agave. Domestic agaves included (popular names in parentheses): Agave zapota (sapodilla), Agave atrovirens (maguey), Agave fourcroydes (henequen), Agave latissima (maguey). Agave mapisaga (maguey). Agave sisalana (sisal) and Agave tequilana (tequil maguey). 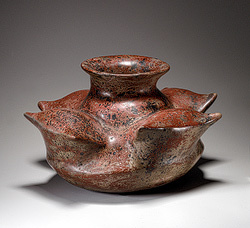 In about 2,000 BCE, maguey was grown in Tula, Tulancingo and Teotihuacan, where obsidian scrapers have been found, suggesting the agave was used for aguamiel or pulque. The ancient Aztec riddle asked "What points its finger at the sky?" and the riddle's answer is "the Maguey Thorn." When the Conquistador Hernan Cortez wrote to King Carlos V of Spain in 1520, he noted, "honey is also extracted from the plant called maguey, which is superior to sweet or new wine; from the same plant they extract sugar and wine, which they (the natives) also sell." The hunting and gathering tribes had good reason to regard agaves with special attention, because agaves supplied them with food, fiber, drink, shelter, and miscellaneous natural products. Protection may have been one use, for when planted around a cottage, the larger species make armed fences, a common practice in modern Mexico. While much about the first beginnings of agriculture will always remain obscure, there is a great deal now known about the history of man-agave relationship. From 7000 B.C. onward the use of agave is documented also by archaeological specimens of quids (chewed fiber rejects), by artifacts made of agave fiber, and the tools used in their manufacture... 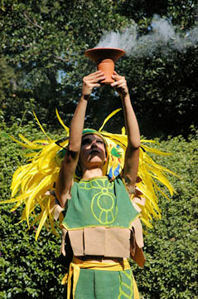 In Mesoamerica the many evolving varieties and forms of Agave species were selected by man, moved from place to place with him, and inadvertently crossed. As man lived with these varietal eventualities through the centuries, he was provided with new genetic combinations that he could check empirically for yield and quality of fiber, food, beverage, and other special products. As he specialized with civilization, he specialized agave, selecting characteristics according to his wants. Even though he had no concept of genetics, he quite innocently fostered an explosive evolution in agave diversification. The main source of food in agave is the soft starchy white meristem. in the short stem and the bases of leaves, excluding the green portion. As the plant matures the starch and sugar content of these organs increases, as does their palatability. Some species and varieties are more palatable than others; those with high sapogenin content and other toxic compounds were generally known and avoided. The young, turgid, tender flowering shoot of most species is edible, as are the flowers of many. The early agriculturist doubtless selected only the sweet sorts for cultivation. The sapogenous species were not domesticated. Since merely supplying heat converts the starches to sugars, the Indian cooked the softer parts by direct fire or with hot water. In earliest times the cooking of agave was crude. "Cooking appears to have been largely of the roasting type, with the outside frequently charred, and the interior still raw. This is true of such plants as Ceiba, Agave, and Opuntia, though they appear to have been eaten raw almost as frequently" (Callen, 1965). Charring of agave flowering shoots by laying them in the fire or in hot coals and ashes overnight was still observed among the backcountry Mexicans in the 1970s, especially to appease hunger on longer journeys. From the time the Mexicans had pots, these flowering shoots were probably boiled, a practice extended to modern times in Mexico. A more sophisticated or communal method for cooking agave was pit baking, which became universal, at least north of Mesoamerica, and which has been mapped and fully discussed by Castetter et al. (1938). Agave pit baking was a family or group effort, generally with men and boys collecting the wild mescal heads ("cabezas"), the women and girls gathering firewood and cooking. A pit large enough to hold many heads was dug and lined on sides and bottom with stones. A large fire was burned in the pit to heat the rocks and form coals. When the fire burned down, the Agave heads were pitched in the pit on the hot stones, or sometimes on a layer of green grass, palm leaves, or other green leaves. The heads were covered over with leaves or grass and sufficient earth on top to prevent steam from escaping. The mass was allowed to steam-cook for one or two days. The time necessary for cooking depended on the amount to be cooked, size of the heads, tribal customs and ceremonies. The cooked heads were cut up into chunks, after separation from the leaf butts and both could be eaten at once or could be stored indefinitely for future use. They were also pressed into flat cakes that could be easily carried and were bartered in trade between tribes. The expressed juice from the cooked chunks was rendered into syrup. Candies were also prepared with this syrup. There is considerable fiber in these chunks of agave, which when chewed are rejected and, if left in the litter of dry camp sites and caves, become the quids of archaeology. This description barely outlines the practices of agave pit baking as we know them from northern Mexico and Southwestern United States. I have seen mescal pits as far south as northern Sinaloa and Durango and have seen baked agave in the markets of central Mexico. However I have seen no account of the practice in Mesoamerica. Miguel del Barco wrote an excellent account of the practice in Baja California. Among other food uses of agave is the boiling of the flowers of some species or, more commonly, scrambling them with eggs, as reported about Tehuacán. Among the Mixe Indians in the mountains of Oaxaca, the cuticle of Agave atrovirens and other species is put to a singular culinary use. The cuticle is peeled from the leaf and employed as a wrapper for tortilla sandwiches and other foods carried as lunch to the field. It forms a translucent sheet looking like an archaic forerunner of modern polyethylene plastic. This practice was drawn to my attention by the conspicuous rectangles appearing on the broad leaves of agaves, growing about the Mixe fields and houses, as a result of skinning off sections of the cuticular wrapper. In Saltillo, Coahuila, bread is still made with pulque, which gives the bread the distinctive flavor of pulque. Vinegar is easily made from aguamiel and alcohol has been distilled from pulque. The Aztecs told of how Quetzalcoatl ascended to the sky to fight the evil goddess Tzintzimitl, but instead he found her granddaughter, Mayahuel, the goddess of fertility, portrayed with four hundred breasts. 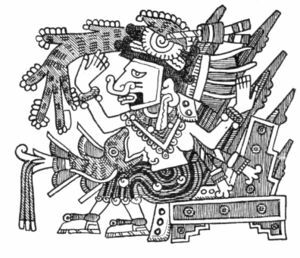 Quetzalcoatl fell in love with her and brought Mayahuel down to earth to live with him. When the evil goddess found out, she hunted for them. 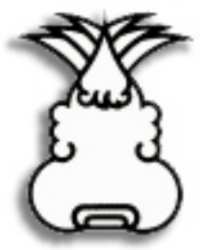 Mayahuel was killed in the fight. Quetzalcoatl, buried the remains of his lover, then flew to the sky to kill Tzintzimitl. Every night Quetzalcoatl went to her grave and cried. The other gods saw this, so they placed a plant with special properties at her burial site. When he drank the elixir from that plant, Quetzalcoatl received comfort. The Nahuatl believed this is how the agave came to be and explains why tequila is said to comfort the soul of those who have lost someone dear to them. Another ancient Mexican legend says the maiden Xochitl (pr. Soo-cheet) discovered the fermented honey inside the agave. Xochitl means "flower" in Nahuatl. The Aztecs used agave fibre in the manufacture of an all-purpose sack called an 'ayate.' In 1531 an ayate was imprinted the image of the Virgin of Guadalupe, since then the Patron of Mexico. In Hidalgo, the Otomis still make fabric from the agave; the men and boys separate fibre from leaves while the women and girls do the weaving. Agaves used include salmiana, americana, striata and lechuguilla. 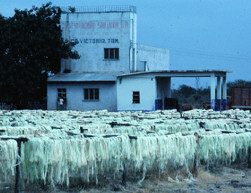 Henequen fibre is produced from Agave fourcroydes and sisal fibre from Agave sisalana (the stronger of the two fibres). The quiote is dried and used as beams and posts in houses or other construction. The dried quiote is surprisingly light and durable, like balsa wood, but more fibrous. Agave was considered sacred by many Pre-Hispanic people. The oldest records come from the Aztec codex, the Tonalmatl Náhuatl, ("Aztec pilgrim's papyrus"), which tells the story of the Mexican people. According to the codex of Nutall, Laud, Florentino and Mendocino, natives had many different uses for agave and its sub-products: food, threads, needles, shoes, roof tops, clothes, nails, weapons and paper among others. The seeds have been ground into powder to make bread or to thicken soup. "As a whole (maguey) can be used as fuel or to fence fields. Its shoots can be used as wood and its leave as roofing materials, as plates or platters, to make paper, to make cord with which they make shoes, cloth, and all kinds of clothes…. From the sap…they make wines, honey, vinegar, and sugar…From the root, they also make very strong ropes which are useful for many things. The thicker part of the leaves as well as the trunk, cooked underground…are good to eat…There is nothing which gives a higher return." The agave is still used as food today, although it is not as critical to the natives as it was in the past. Agave syrup or nectar (aguamiel) has always been popular in Mexico, but in the past decade has become popular in the health food circles because it provides a good alternative to cane sugars that diabetics can also tolerate. Steamed quiote can be bought from street vendors in markets in the tequila-producing regions. It is mildly sweet and fibrous. Some vendors also sell the roasted agave, which has a rich caramel-honey flesh that you strip from the fibres with your teeth. Agave leaves are sometimes fed to livestock as fodder. One species (Polianthes tuberosa) is used to make flower ornaments and to extract volatile compounds for perfume manufacturing. Another species, agave lechuguilla ('amole de lechuguilla'), is known for producing a soap substitute used by natives. Agave lechuguilla is also the principal source of a hard fibre known as istle or ixtle, used for rope, twine, brushes amongst others. It is also known as ' Tampico fibre ' and used still in the USA and Europe for the manufacture of brushes. 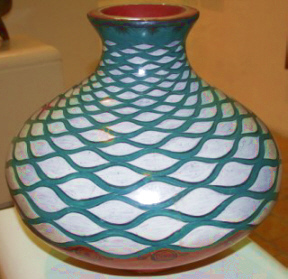 For millennia, the Hnahnu people used the agave as a source of material to produce more 100 different products including fibres for weaving, brushmaking and other crafts, construction materials, soap, small furniture, toys, ornaments, food and beverages, paper, medicinal products, firewood and even boundary markers in the countryside. The Hnahnu retain a deep traditional knowledge of the life-cycle, characteristics and uses of the agave. Agave is still used as medicine, particularly in boticas - pharmacies - usually in alternative medicine boticas that offer natural or homeopathic remedies, often selling them beside religious icons and images on the same shelf. One botica online promises agave essence will cure "emotional immaturity, aggressive conduct, impatience, fatigue and premature aging. Before the mid-1800s, there were a dozen agave species used for tequila. But the producers were specializing, growing those that made the best economic as well as aesthetic product. By the 1870s, the indigenous people of Mexico had so refined their cultivation practices that physiological ecologists of today have barely bettered them. By the 1870s tequila was reduced to the monoculture of blue agaves. In March, 2007, scientists at the University of Guadalajara have announced they believe the blue agave contains compounds that may be useful in carrying drugs to the intestines to treat diseases such as Crohn's disease and colitis. 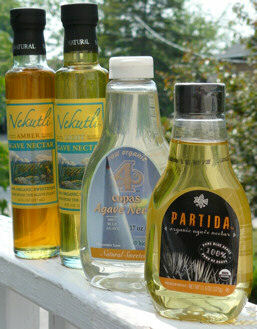 Perhaps the biggest potential market for agave food products today is the growing agave nectar or syrup market. Agave syrup consists primarily of mostly the easily digested fructose and s smaller percentage of glucose, the amounts depending on the producer. It is sold as a sugar substitute in many health and grocery stores (agave syrup is three-four times sweeter than table sugar). While similar to honey, agave nectar's glycemic index is only 27, compared to honey at 83, which means it is absorbed more slowing into the bloodstream. Agave nectar is primarily made in Jalisco, but not necessarily from Blue Agave. In September, 2006, British food chain giant, Tesco, announced they would be stocking agave nectar in all their stores. Agave nectar does face competition in another natural product, stevia, produced from a sweet herb native to Central and South America. At present, stevia can only be used as a dietary supplement, but not as a food additive in the USA. This leaves the playing field open for agave nectar until stevia gets more approvals. Rural development officials in Mexico are pitching miel de agave, or agave syrup, as a sweetener that is ideal for soft drinks and other foods. Increased miel de agave production could also provide another market for agave growers. "Agave tequilana is harming the genetic diversity of other agave species. Not only that, says Patricia Colunga of the natural resources unit at the Centre for Scientific Investigation in Yucatan, Mexico, but the area available for traditional food crops is falling, and the intensive farming is leading to soil erosion. Colunga and colleague Daniel Zizumbo interviewed farmers from areas south of Jalisco state, and across Tequila-Amatitan, regions of west-central Mexico that are important sources of agave plants. They asked about the types of agave grown, and collected samples of plants (Biodiversity Conservation, vol 16, p 1653). "South of Jalisco is the nucleus for the greatest diversity of traditional varieties of agaves in west-central Mexico," says Colunga. "The diversity and the traditional products that it supplies are part of the cultural heritage of Mexico and should be conserved." The farmers said that traditional agave varieties can be grown with staples such as maize, beans and squash without recourse to herbicides, but Agave tequilana is grown in monocultures that require the use of herbicides."